Check to see if your Anti-Virus is working properly! How would you like a simple way to check and see if your anti-virus program is up to scratch? Well, the Anti-Malware Testing Standards Organization (AMTSO) has recently launched a free online service which provides just such a facility. The AMTSO service includes 5 tools to help users verify that their anti-virus protection is working and/or configured properly. 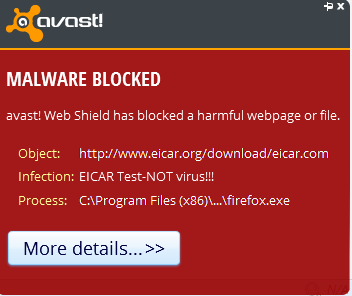 So, Avast Free failed 3 out of the 5 checks. I’m not quite sure what to make of those results to be honest, especially failing the PUA test (#3). Although, if you read on, toward the bottom of this article you’ll see where there is evidence to suggest that many of the commercial anti-virus products may also struggle to pass some of these checks. I also have Microsoft Security Essentials installed on a laptop so I decided to check MSE through AMTSO’s tool-set as well and see how that compares. The results were identical, with MSE passing the first two tests but failing the last 3. Although, to be fair, in the case of test #5, MSE doesn’t include any cloud-based detection feature nor does it claim to. It appears to indicate that when you click on the name of the vendor, as directed, you’ll be able to view precise guides on how to enable/configure particular features. In reality, the links merely lead to each vendor’s home page. I am guessing this aspect is currently a work in progress. Interestingly, AMTSO is reported to be encouraging anti-virus vendors to join them in ensuring their products meet the standards… “participating antivirus vendors agree that they will configure their product to detect specific harmless files or Web pages in the same way they would a malicious file. Fifteen major vendors have signed on so far, although not all support all the checks, and AMTSO expects more vendors will eventually come on board” … and that suggests to me that many of the commercial products may also currently fail the majority of AMTSO’s checks. Anyway, it was an interesting exercise and one which I suspect many users might also like to go through. For those of you who are interested; it would be greatly appreciated if you could post the results for your particular anti-virus via a comment. Who knows, if we receive enough responses, it may help build a clearer picture for all concerned. Are you talking about the link at the end of the article? No 404 message here, no problems connecting to the site at all. Miserable fail > Tick.. Microsoft Security Essentials one alert only! Kaspersky Internet Suite totally saved the day, Mindblower! Checked with MS Defender in W8; passed #1 and #2. Failed the others. Seems to work as well as avast and comes built-in to W8. Make what you will from these results. Test 1: Android indicated that a download had started, but the notification area showed the download was unsuccessful. I repeated this test 4 times; the file successfully downloaded once. Test 3: Downloaded successfully. However, the download file was intended, presumably, to mimic a Windows executable which would not run on and so pose no threat to an Android device. Would the testers be able to reconfigure their site to test Apple and Android devices? I’m not quite sure how pleased or otherwise to be with my free AVG! Kaspersky blocked every one, Microsoft Security failed 3, 4 and 5. Thanks for the opportunity to test, Jim. Used BitDefender Antivirus Free on my laptop and it successfully blocked Tests 1-4. On Test 5, the file was downloaded, but would not run. Tested it with webroot secure anywhere antivirus. Passed all 5 test. I use McAfee that comes with my ISP subscription. I could not download any of the files, but I could visit the phishing site if I ignored the warning not to go there. Tested this with Norton Internet Security 2013 suite which stopped all 5 threats :-). Excellent. And the AMTSO site was already flagged as an unsafe site by NIS13 in my Google results (I never ever anymore click on links if I can avoid and first paste them into Google search to see what comes up…). Bitdefender passed first 4 tests. I use System Suite (Avanquest). Passed all but #4. Double clicking all 5 of the test downloads did nothing so guess all 5 tests were successful. AVG Premium Security 2013… 5 out of 5 blocked. I have Vipre Internet Secuity and mine passed all the tests. Would not let me go to any of the downloads. Just checked with AVG FULL version. Using Beta AVG 2014 as a Beta participant. I all five tests AVG blocked the action. P.s. In three cases even my browser (chrome) reported tha\t the page was not available. I wonder why. Can only assume that Chrome’s built-in security was recognizing the files as genuine threats… which is a good thing.